Yvonne Gahagan is the owner and flower extraordinaire of Gahagan Farms LLC, a beautiful haven for flowers, butterflies, and multiple species of bees. Her farm is located in Williamsburg, PA, and is surrounded by corn fields and a small dairy farm. Gahagan Farms has been in business since 1999 and has been a vendor at the downtown Cumberland Farmers Market for almost 13 seasons. As I stood in the field at Gahagan Farms, I was struck with amazement at the beauty that is sewn into the fields. Rows of plants were brimming with color, as bees and butterflies bounced from dahlias, zinnias, sunflowers, millet, and many more savoring the sweet nectar from each carefully planted flower. Gahagan Farm is located on a now re-purposed dairy farm. The barn that once housed dairy cattle and tanks now is home to walk-in coolers, dried flowers, seedlings, starter trays, and carefully hand crafted floral wreaths. The process begins in early spring. Yvonne transforms her barn walk-in coolers to seedling incubators. As the seedlings begin to emerge, she prepares her field for transplanting. She uses local manure to enhance the nutrient in her soil. She separates her fields into three separate gardens: annuals, perennials, and a sunflower patch. Recently, she has learned to color coordinate the plants to allow for easier harvesting. We walked through her garden as Yvonne pointed out each variety of flower and spoke to their beauty. Yvonne grabbed her clippers, and her true passion began to show. She walked through the field and began arranging the most beautiful bouquet I have ever had the pleasure of holding. Yvonne started Gahagan Farm to fulfill a niche market. However, it is easy to see that her business is showcase for her talents and passion. In addition to being a long-time vendor of Allegany Farmers Market, she arranges flowers for weddings, funerals, and other occasions. 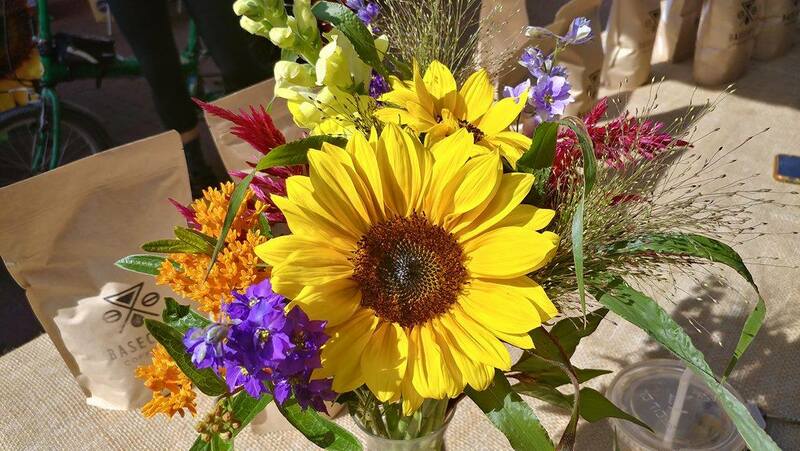 She invites guests to her farm or to the market and allows for creative freedom in each bouquet that she arranges. If you would like to learn more about Gahagan Farms. Visit Yvonne in downtown, Cumberland on Thursday from 9:30 a.m. – 1:00 p.m. Follow them on Facebook at Gahagan Farms LLC for more information. Place the beets and 1 tablespoon of the salt in a large pot and add enough cold water to cover by 2 inches. Bring to a boil, reduce heat to a simmer, and cook until a paring knife can be inserted smoothly into a beet, about 25 minutes, depending on size. Drain and rinse under cold running water until beets are cool enough to handle. Remove the skins. Place beets in bowl and refrigerate for at least 1 hour, or until cool. Slice the beets in half lengthwise. Arrange the halves on a serving plate. Drizzle with oil and vinegar, then sprinkle with the remaining salt and the pepper. Serve with a dollop of sour cream and dill. Lay out your slices of bread. Add 1 slice of cheese to 2 slices of bread. Add apple slices on top of each slice of cheese (divide the apple slices in half between 2 sandwiches). Top with another slice of cheese, and then place the remaining bread slices on top. Slather butter on the top piece of bread. Heat your skillet over medium heat, and lay the sandwiches with the buttered bread touching the skillet. Butter the top piece of bread now. Place a sandwich press or heavy bottom skillet on top of the sandwiches to press them down. Cook for 3-4 minutes on first side, or until browned. Flip carefully and cook 2-3 minutes on the other side, allowing to brown (careful – second side usually cooks faster). Slice sandwiches in half and serve immediately! Set a large stock pot or Dutch oven over medium-low heat. Add butter and melt. When the butter has melted add the onion and leek. Add a pinch of salt to help the onion and leek sweat and cook for 4-5 minutes until tender and transparent. Add garlic and corn and cook for 2-3 more minutes. Sprinkle in flour and whisk. Slowly add chicken broth and then milk. Turn heat up to medium-high, then add potatoes. Season with salt, pepper and cayenne. Simmer for 25 minutes or until potatoes are tender. Once the potatoes are tender and the soup has thickened, remove from the heat. Add in cheddar cheese (and parsley) and stir until incorporated. Spoon into individual bowls and top with crisp bacon pieces. Serve immediately. 2. Place onion in a strainer and rinse with cold water to mellow its flavor. Drain well. Mix onion, remaining 5 tablespoons oil, tomatoes, basil, 1/3 cup lime juice, and thyme into corn. Season to taste with salt, pepper, and more lime juice, if desired. K&K Farms is a 350 acre farm located in Mount Savage, MD. Owners Kayla Melkovics and Kaitlin Rossignulo operate K&K Farm as a flourishing produce farm on their family property. As young children, Kayla and Kaitlin spent their days with their grandmother learning to garden and preserving their harvest, which cultivated their passion for food production. After spending their youth learning the art of gardening, their endeavors are now fruitful for the farmers’ market patron. K&K Farms’ market booth explodes with an abundance of tomatoes, zucchinis, butternut squash, cucumbers, peppers, radishes, potatoes, green beans, mulberries, blackberries, cherries, apples, watermelon, corn, pumpkins, and free-range eggs. In addition to produce, K&K Farms offers baked goods. A Pinterest worthy Mason jar pie is among their popular farmers’ market treats, made with a fluffy pie pastry, filled with fresh berries, and served in a mini Mason jar lid. The female owned and operated farm holds a bright future for the young entrepreneurs. They plan to expand their farm to include more baked goods and fresh bread. Visit K&K Farms on the Downtown Cumberland mall, on Thursdays, from 9:30 am to 1:00 pm or City Place in Frostburg, on Fridays, from 9:30 am to 1:00 pm. Today, more than ever it seems, it’s easy to get caught up in the world’s negativity. It’s everywhere your ears can hear and your eyes can see. Social media and news outlets are rampant with all the things that are less-than-ideal today. Our food system is no different. Every day we hear the horrors of mass manufactured food, GMO’s, feed lots, and slaughterhouses. I will spare you the details of everything that is wrong with our current food system. That’s not the point of this journey. Over the past two years, I have developed from a consumer, to working on a farm, to being employed by farmers, to now being able to call them good friends. This is a journey that you are able to take, as well. So yes to farms, and yes to food. My journey began on Savage River Farm. At first, I did not feel I was an ideal candidate to spend long days in the sun, bent over transplanting, feeding animals, harvesting, and other daily tasks that the farm life holds. However, with an open mind and a will to learn, I began working for a food trade CSA. I offered all the help I could, and in exchange, I was able to bring home a plentiful farm fresh bounty. I am able to be as active as time allows to be a part of the food I consume. I’ve learned so much about growing vegetables, animal stewardship, and the daily life of a farmer. No one thinks that farming is an easy lifestyle. If so, we would still be a land of self-reliant farmers. 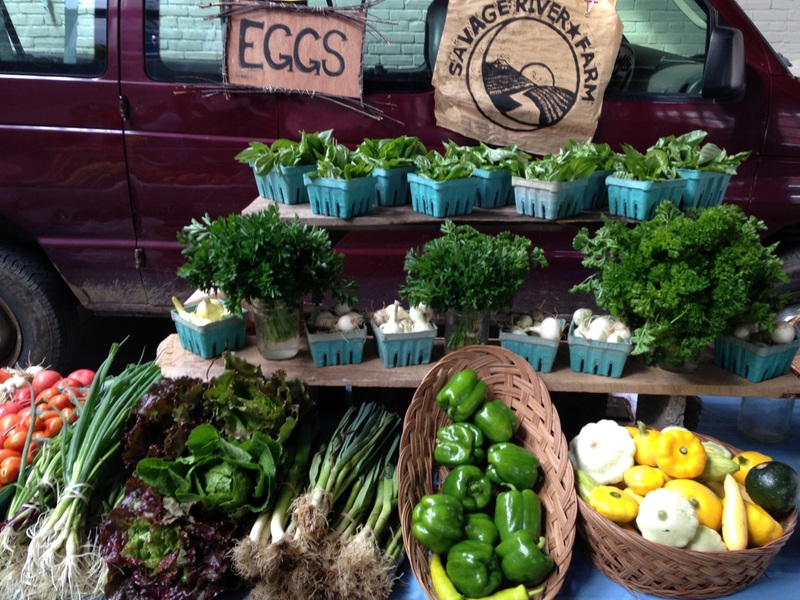 However, I am taken aback with the Savage River Farm family - Ben, Hana, Whitney, Ian, Little Ben, and all the farm hands. Their daily life is exhausting and everything goes as planned about 1% of the time, it seems. Still they are hardworking stewards of their land. They follow their passion, they invest in their knowledge, and they persevere with good spirit in their heart. All this hard work is to feed themselves and their community. Today, I am the first non-farmer to be employed by The Allegany Farmers’ Market. My role is to promote the farmers’ market, the farmers, and the local food grown in our area. 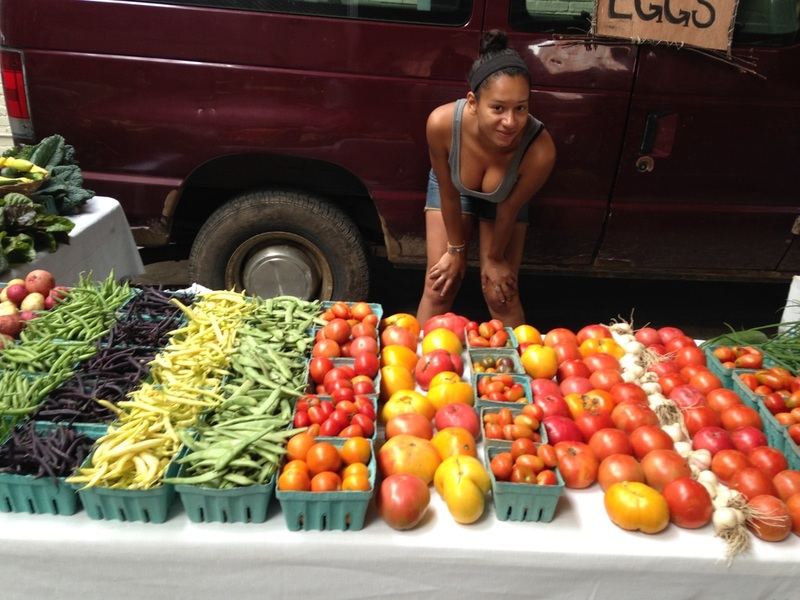 I began my journey as a patron of the Frostburg Farmers’ Market. Here, I was acquainted with the farmers and the food that was available, and I would often engage in conversations with farmers to learn more about their produce and the delicious meals I could create from their harvest. In May 2016, I was hired as the Marketing Manager, and I jumped with both feet off the ground into the world of the farmers. I visited Backbone Food Farm, Goodness Grows, Person’s Farm, Walnut Ridge, and am planning trips to more farms this year. I stepped foot on each farm with amazement for the natural beauty that is abundant on their land. I was invited to be a part of their day, and spoke to their children, grandchildren, and farm hands that are so entwined in their daily life. With all the natural beauty, there is a lot of soul that goes into growing their food. This is their dream, their lifestyle, and their livelihood. Our Farmers endure hardships, growing pains, and triumphs daily. The climate in Western Maryland and surrounding areas provides a limited growing season, and what farmers plan to grow is often affected by the varying weather patterns. If farmers have a great crop of peaches, nature may claim their predicted plum harvest for the season. The beetles may eat all the crop of green beans, and a drought may affect lettuce production. Higson Farm, a lifelong farmers’ market vendor, is often faced with the possibility that a frost will eliminate their strawberry harvest. Through dedication and hard work, farmers see business growth and a lot of triumph. Last year, brothers Mark and Keith Rinehart, of Walnut Ridge Farm, quit their full time jobs and embraced working on the farm full time with their mother Jeanette Rinehart. Walnut Ridge Farm has been a lifelong vendor of the Allegany Farmers’ Market. 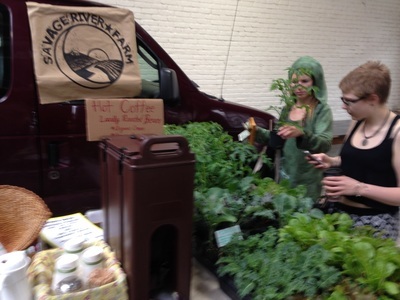 They have expanded their business operation to include prepared foods and baked goods, and as part of their distribution model, they run several independent farm stands and launched a farm fresh delivery service. Participants can choose to have food delivered to their home or work. 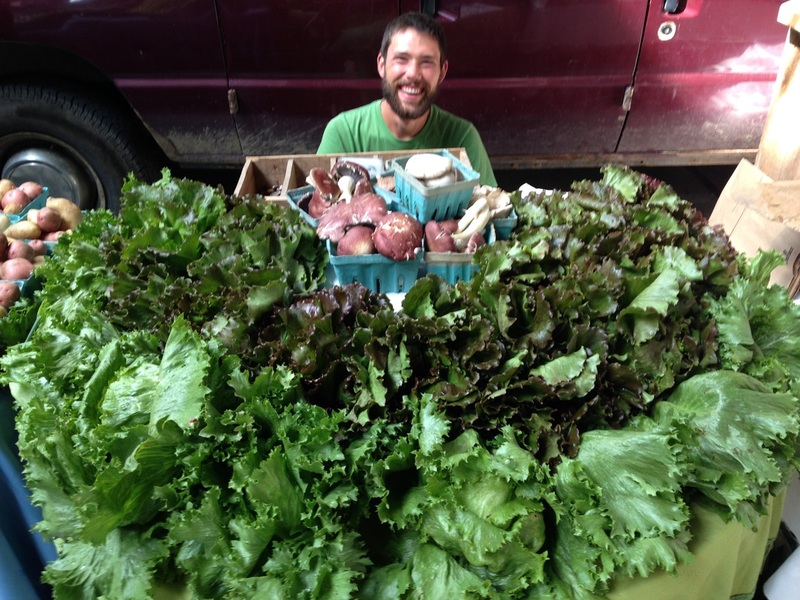 In Allegany County, delivering farm food is a small step to increasing community access to locally grown food. If you’re a human, you eat - it’s a fact of life. When you choose to support local food systems, you help to alleviate the negativity in our mass produced food system. Each purchase you make from a local farmer supports local food production and agriculture, a farmer feeding their family, and a farmer feeding your community. We can empower the people in our communities, who live in food deserts, to support access to nutritious, locally grown foods. I will leave you with the story of everyday Allegany County citizens helping to change the world they choose to live in. Last year, members of Savage River Farm CSA came together to donate food s to families that were not as fortunate to purchase these goods. Through these donations, families were able to eat the bounty of local food. This is a great example of ordinary people helping to change other community members’ lives. This is an invite to all who read this - let us become the small group of committed citizens that change the world. It is not a change that happens overnight. Be active in your consumer decisions. Remember this is not a one way conversation, but rather, an open discussion. Please leave comments, visit our Facebook Allegany Farmers Market, or send us an email at Alleganyfm@gmail.com to become part of the conversation. Fall in love with coffee all over again! Basecamp Coffee is all the buzz to be in your morning cup! Owner Hayden Ort-Ulm has been roasting coffee since “Snowmegadon” of 2016. He looks back fondly on the memory of delivering his first bag of coffee. He drove down a snow covered driveway leading to Leaning Pine Farm. Hayden and owner Sam White sat in the kitchen. The coffee banter was as warm and comforting as the snow blanketing the world outside them. When I sat with a cup of coffee with Hayden. I asked him why he wanted to start roasting coffee in Cumberland, MD, of all places? He explained he has lived in Seattle, WA, a haven for coffee lovers. The culture of coffee was well and alive in the lifestyle of Seattle. When he moved back home, he also wanted to become an entrepreneur. He aspires to open his coffee shop on Greene Street and fill the neighborhood with the sweet aroma of freshly roasted coffee. After establishing a market need for locally roasted coffee, Hayden set off to attend Vermont Artisan Coffee Company. He majored in a 5-day course to learn the fine art of coffee bean roasting. Basecamp receives its coffee as green beans in a 180-pound burlap sack. He home roasts each 5-pound batch using a machine that he describes as a “gadget full of gizmos.” Over an open fire, a drum spins, roasting each bean to sweet perfection. It requires a high skill level, but it is a step up from his humble beginning of roasting coffee. His earlier days were best described as a machine similar to the old school popcorn machine. Jiffy puff anyone? Quality is of the highest focus at Basecamp Coffee. Every 150-pound burlap sack of green beans is tested to assure that the quality of bean is the highest it can possibly be according to the standards of The Specialty Coffee Association of America. This task can sometimes take up to 45 minutes for Hayden to complete. Basecamp Coffee Company offers more than five different roasts of coffee. Its beans are ethically sourced.The Ethiopian blend is certified organic and fair trade. Each of Basecamp’s coffee has a unique history of growth before they are shipped to Cumberland. The Ethiopian blend is not grown on plantations; each bean is handpicked. After the community picks beans, they are processed by bicycle power. That’s a bean prepared from a wild ride! The Brazilian Estate is growing on one farm, owned and operated by all women! City Place Frostburg Fridays 9:30am-1:00pm. Winter Market Frostburg & Cumberland. If you miss the market, you can find Basecamp at Mountain Shine Creative, Wholesome Harvest, and Shift. It also accepts personal bulk orders. For more information, check out Facebook @Basecamp Coffee Company. Using a large skillet, heat the olive oil over medium high heat. Saute the onion and cook for 3 minutes, until softened. Add the garlic and ginger and cook for 30 seconds, or until fragrant. Stir in the butternut squash, broth, potatoes, curry and spices and bring to a boil. Reduce heat to low, cover and simmer for 10 minutes, stirring occasionally. Add in the tomatoes and chickpeas and cook for 5 minutes more, covered, until the tomatoes are softened. Remove from heat. Serve over rice if desired and garnish with cilantro.